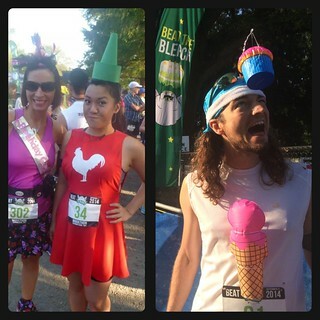 This weekend was the inaugural Beat the Blerch marathon (and 10k and half) outside of Seattle. Also known as: the non-runners marathon. The “sit on the couch and eat cake and watch RoboCop” marathon. Sure there were some fast runners there, but there were less than 300 full marathoners and most were there to have a good time. If you take racing really seriously, this isn’t for you. Move along, un-fun people and make room for us, those who like talking to people, wearing costumes, and eating cake. It was unexpectedly popular (by the Oatmeal and the race director) and the site crashed almost immediately upon registration opening. I had a great team of family and friends registering and I got in! The website crash and very long wait-list showed the demand, and Oats and the RD got approval for a second race, on Saturday. The Oatmeal ran in costume too. Fast forward to this weekend…it was a quick trip just for the race. 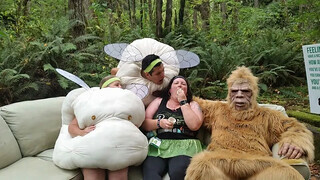 I did squeeze as much as I could, but I had friends doing the race both days, so I got to spectate Saturday and participate on Sunday. Parking was a breeze! We got nervous the week of the race since an email was sent out saying they oversold parking passes. 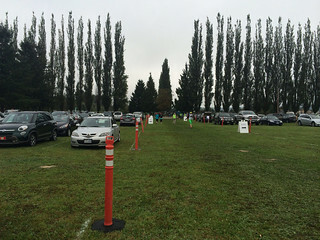 However, there were schools and businesses across the street from the park with tons of overflow parking. But, the field had plenty of spaces. It was never an issue. Even the parking lots are pretty in Washington! Ever done a race where they spray painted spots? Details make a difference! 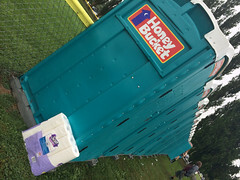 I was so excited to see a huge bank of porta-potties! I was so impressed with how many they had. I’ve done marathons 5+times this size that only had half this number. NEVER any line to them. Not once. Anyone who walked up to them, found one that was open. And clean. Very, very clean. tons of places to pre-race poop! 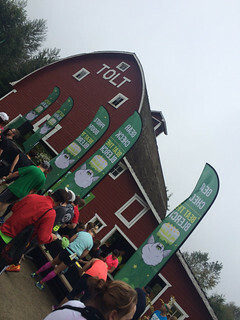 The race started at Tolt-McDonald park. Tons of room and a very charming barn that housed bag-check, post race food, and other logistics. 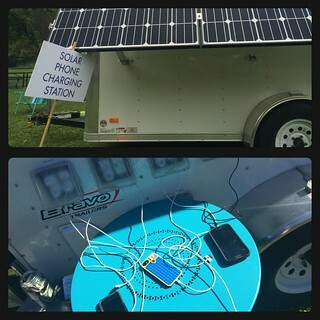 Ever seen one of these solar, cell-phone charging trailers? Yeah. He paid to have one out at the race. So cool! 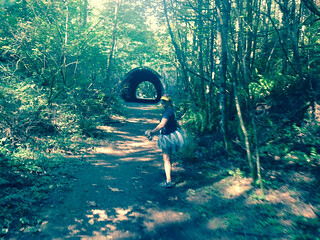 From there, we ran about a mile and hit the river, then over some bridges to the Snoqualmie Valley Trail. This was gorgeous. The crushed gravel had some rocks that were a little bigger than I’d like for crushed gravel, but it was fine. Nothing to complain about, especially since the scenery was gorgeous. It was 86 degrees by the time we finished, making for a really hot day, but I was so thankful for the trees. Blerchy tu-tu and pretty trails. Overall: WORTH IT. 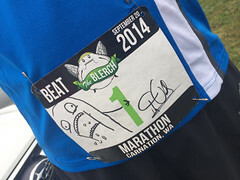 For the cost of an average marathon ($100), the race company and the Oatmeal went above and beyond. I do so many of these I never have any expectations. This ranks in my top 5 marathons. 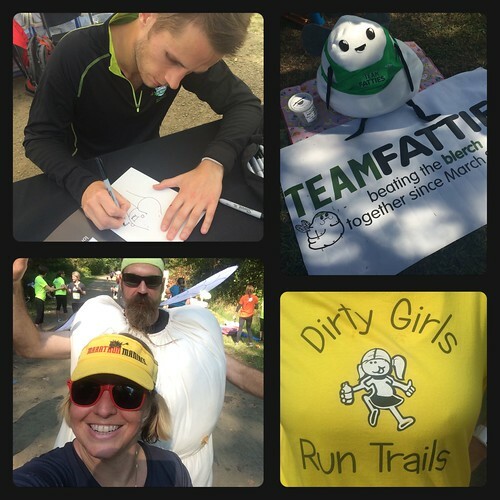 The shirt, FREE RACE PICS, the HOURS of book & bib signing by Oats, the abundance of food, the aid stations, the fun volunteers, the tons of porta potties, the ease of parking/logistics. All top notch. My mom even saw my race shirt and said, “Did you buy that too? !” (she meant in addition to my race packet). 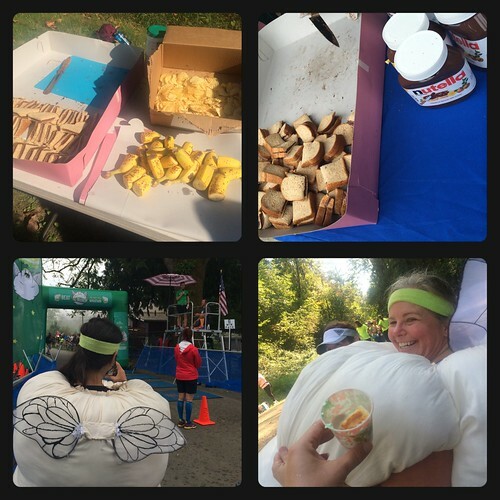 For her to comment on it…huge compliment that she didn’t think that it was the race shirt. Lots of Nutella pushing Blerches. 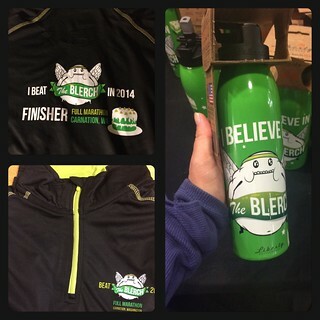 Other stuff: BLERCH. 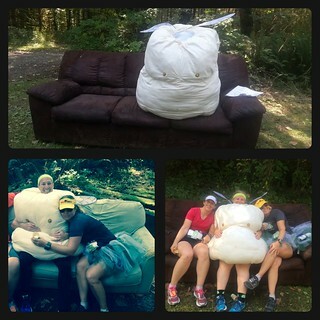 The volunteers were so fun! 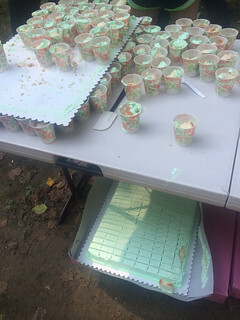 They all embraced the “Blerchyness” of the event and pushed cake, Nutella, magical grape drink (explained in his book, and yes, it is magical), and then other regular race foods such as Gu shots, energy bars, chips and pretzels, bananas, etc. Due to it being on the trail, the aid stations were 3-4 miles apart because of the limited road access. This was fine for me, but the heat at the end had us wishing there were 1-2 more on the course. However, that was impossible. For people who haven’t done trails or ultras, I can see how it would be a shock to go from a road marathon with water every mile, to this. 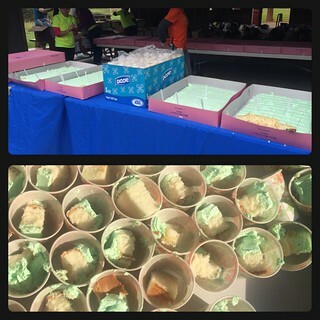 However, the aid stations were well stocked, and FUN. Oats signing my book, fun spectators, me being chased by a Blerch, and a cute shirt. The race/run itself was uneventful for me. I ran with my friend Carrie from El Paso. I had talked her into this race while visiting her and her husband for Bataan Death March, so I felt it was the right thing to do to stay with her. We ran her pace, then when she started slowing down and our walk breaks increasing in time and slowing in pace…I made the call to go to my interval timer (about halfway). Things got better after that and had a negative split overall. We were maintaining a consistent pace doing 3:1’s and picked up 2 nice ladies who where half-assed run/walking. They were lovely and fun. 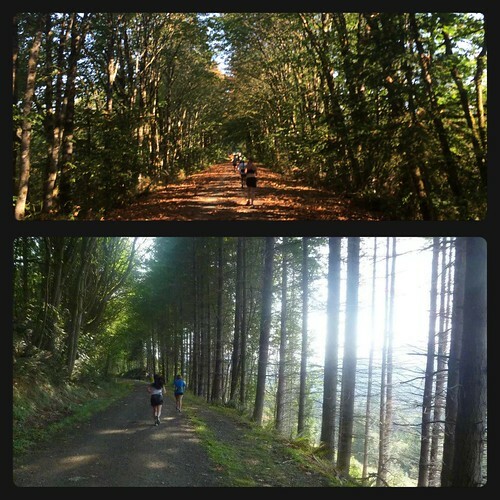 Then, over the miles, picked up 2 more and went down to a 2:1 interval based as a request of the ladies we picked up. We had a fun group during the hard miles of 15-20. The rest fell off by mile 23, but we waited for them at the finish. 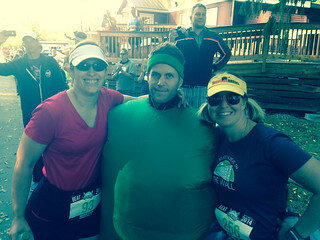 I made some new running friends and had a delicious post-race burger with Ann from Kansas City. As a cancer surgeon, we hit it off and had lots to talk about besides racing. Turned out, she has a friend who was in the Army…who was one of K’s chemo providers when we lived in El Paso. ❤ SMALL WORLD. I love races where I have no goals other than to finish. It allows for maximum fun, and you never know who you’ll meet! 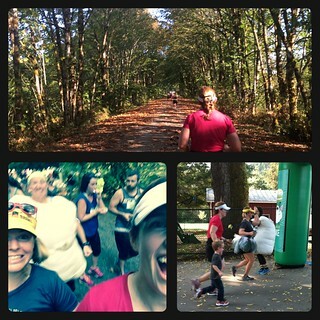 This entry was posted in Uncategorized and tagged beat the blerch, blerch, marathon, Marathon Maniacs, running, the oatmeal by HaleyComet. Bookmark the permalink.